BBC Two gets a refresh for the first time in 20 years. If you switch on BBC Two tonight for your daily dose of Eggheads, you'll notice that the channel is looking different. That's because today sees the launch of 16 new idents created by British and international animators. This is the first time in two decades that the channel has been given a complete refresh, and it's hoped that the new look, which has a touch of trompe l'oeil about it, will better complement its schedule. Created in partnership between the BBC’s in-house agency BBC Creative and brand agency Superunion, the refresh involved collaboration with the likes of The Mill, Mainframe, and FutureDeluxe. Centred around a visual signifier whose curved shape suggests the number two, the new idents tackle the same brief in a range of creative ways, with animations including colourful blobs, furry scuttling creatures, and hypnotic swirling patterns. Check them out in the video below, complete with audio created by award-winning British composer and sound designer Alex Baranowski. These new idents do mean that viewer favourites, such as the fibre optic, paint splatter and neon strip light idents, have been retired to telly heaven. And while we can still relive them on YouTube, it's sad to see them go. Maybe they'd had their time, though. 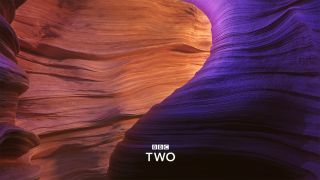 BBC Two is all about pushing the envelope and providing an alternative outlook, so these new idents feel like a perfect fit. Seen in action, the new idents wrap around programme footage nicely, and the array of styles helps to keep the rebrand fresh. "The new channel branding reflects this constantly eclectic and stimulating mix of programming and I am so excited to see it help define this next stage of the channel’s evolution," said Patrick Holland, controller of BBC Two. "BBC Two exists to bring complex subjects and stimulating content to big mainstream audiences," said Mark Tierney, BBC Portfolio head of marketing, specialist mainstream. "The branding challenge is how to package that content, in all its wonderful diversity, in a consistent and memorable way that helps audiences understand what BBC Two is. "This set of new idents wraps all our programmes and our trails in clear, distinctive and flexible yet consistent branding which can adapt all the time to reflect the variety of our content." Laurent Simon, executive creative director, BBC Creative added: "This project is one of those gift briefs that not only allow for the best art and design minds in the country to come together - but also has an immediate effect on popular culture with millions of eyes seeing it every day." Superunion also feels this has been a "gift brief," with Stuart Radford, executive creative director and Katherina Tudball, creative director, saying: "It’s been a privilege to work with the BBC on one of Britain’s most iconic TV brands. Collectively we’ve developed a new approach to channel identity that continuously and seamlessly reflects the breadth of emotions evoked by BBC Two’s stimulating content. Our diverse range of idents allows artistic freedom to our collaborators (much like the channel does for its programme creators), all unified by the iconic curve of the numeral 2." New idents will accompany this initial batch soon, with animations from the likes of Aardman on the way.